Planning for a small private session is tough sometimes because there are so many thing to work on and so many good hockey drills available. An hour never seems like enough time. In these sessions it is helpful to pick out a particular skill and choose only drills that compliment this skill. 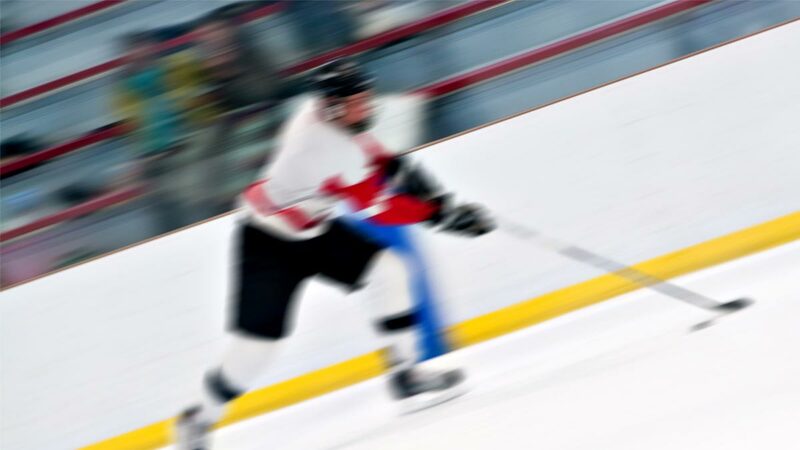 The hockey drills outlined below are geared for an hour long session and focus on transitioning with speed in the neutral zone. The first skill we focus on is the abilitity to transition efficiently as possible with good footwork and facing the puck at all times. The two hockey drills below are a couple good ones to work on this type of footwork. In the first drill, the player takes one or two strides and transitions backwards off their right foot, transitions weight to the left foot, and transitions forwards by exploding off of the left foot and into full stride (I'm looking for a good video to demostrate this and once I do we will post it below). Once the players get the hang of it then you give them a pass as they transition forwards to help them get in the habit of having their stick down and ready to receive a pass as they transition forwards. The next skating drill builds off this exercise. It is failry simple but the execution of the footwork usually give players trouble. Most players will try to cross-over but they should not. At least one skate blade should be on the ice at all times. They should be sitting down as much as possible (even if they have to exagerate it) and have a low center of gravity. The goal is to make the transition as efficient as possible and carry the momentum from forwards into the transition and back the other way. Generally speaking the less snow that is kicked up the smoother and more efficient the transition. This drill will take a while for some players, especiallly if they are in the habit of crossing over, so give them plenty of repetitions at half speed just focusing on footwork. As they get better then increase the intensity. 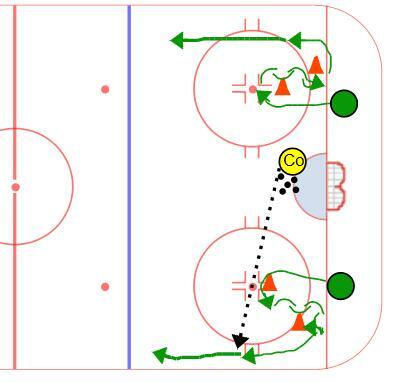 The next hockey drill focuses on attacking the zone. One good way to attack the zone is on an inside to outside path. in order to do this players need to be able to cross over quickly in one direction and then quickly cross-over and explode in the other direction. 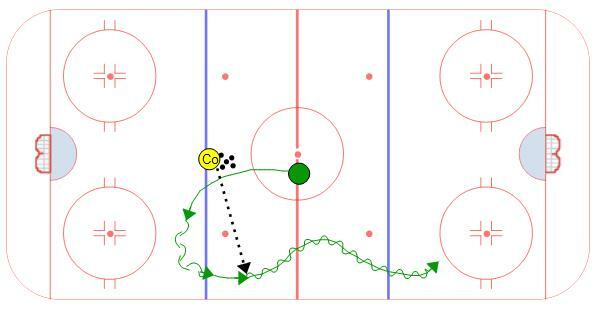 To work on this skill we will use a drill similar to the previous drill but in a different area of the ice. 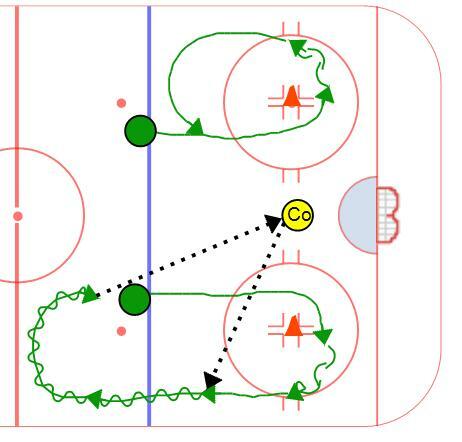 The hockey drill works the same way but after the player transitions fowards they explode towards the middle of the ice crossing over, at center ice they explode with cross overs to the outside. Just to recap, these are three hockey drills that work well in a private session or with a small group of players. Hopefully at the end of the session they have improved upon a skill that can really help a forward become better at attacking the offensive blue line. By: The authorship of this content is not available at this time.